Dallas proclaimed that April 7-14th was Arts Week here in the city. This is a time where we can illuminate the importance of art and culture and inspire citizens and businesses to give back and support the arts community in the same way that it supports each of us. I did not only support arts last week but I participated in it as well: having four gigs last week with a jazz quintet and a brass band. It was a great feeling. As I was driving between gigs, I thought about how art influenced my life. I did not get a degree in music, nor did I ever aspire to attend the Julliard School or Berklee School of Music, but without music, it would not exist. My environment (parents, siblings, friends, community) acclimated me to the arts, whether it was listening to soul/R&B/gospel on our drives to Taylor or Giddings, TX, stealing my sister’s Blackstreet CD at a young age, or being “encouraged” by my best friend to try out for the band (btw: was one of the best “decisions” I’ve made), music and the arts grooms people to become well-rounded individuals who relates to people not only by words, but with their spirit and emotions. With all this nostalgic pleasantries, I became disheartened. I then realized as an adult we, as young African-Americans, are not supporting the arts that helped shape and mold us in our developmental years. Of course there are a few pockets of action…. Quarterly we can go to the South Dallas Culture Center or listen to the Grits play on Wednesday night at The Prophet Bar, but there is a vast discrepancy between our investment of artistic culture and how the arts developed us directly and indirectly. Now we can change that: I’m one of the chairs for the African American Museum Annual Gala and I want to call all of my friends to come and support this Historic Institution in Dallas. On May 18th, hundreds of people will be at this phenomenal event not only to financially support a great art institution in Dallas, but also having fun, looking good, and enjoying great entertainment. 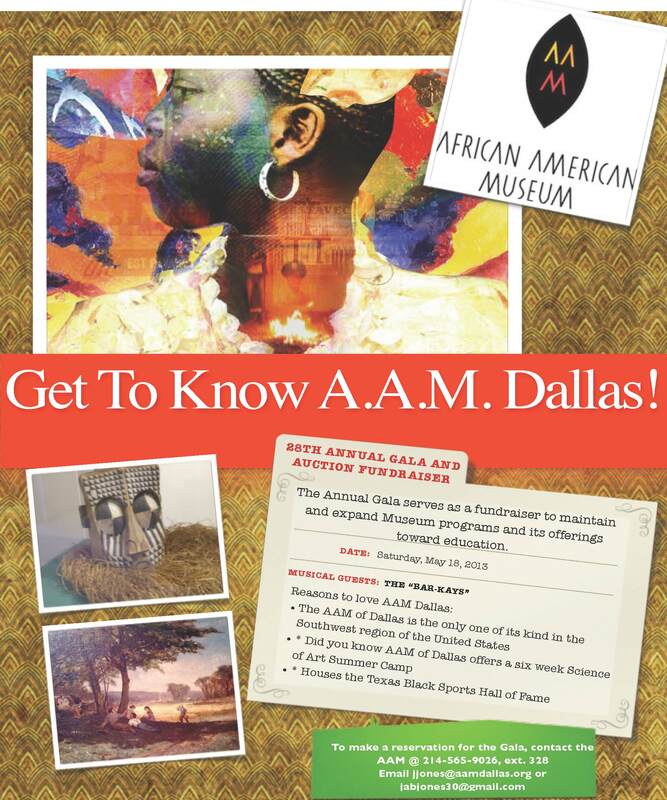 If you are interested, please contact the African American Museum at 214.565.9026 ext 328, or email jjones@aamdallas.org.